I eat out a lot with my mother-in-law, Patti. She is vegetarian and I am vegan, which really does limit the amount of places you can go, especially in Glendale. One place we have gone is PF Chang's, where I get the tofu lettuce wraps. Lately, though, I leave and I am full, but within an hour I am hungry and often sleepy. Wanting my fix of tofu wrap goodness, I set out to make my own. 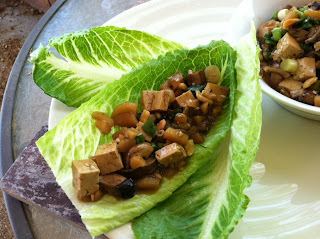 I used super firm tofu, crimini mushrooms, cashews, and green onions in addition to spices, seasoning, and love. This is what I created! It was healthier and tastier than the ones from the restaurant, and a whole lot less expensive. If you have a favorite dish from a restaurant, create it at home! If you have a favorite dish from an omnivore past, veganize it! What you eat is up to you, and only you know what you love.